We are very fortunate to be a part of such a wonderful community where we value sharing in meaningful moments together. Please consider taking the opportunity to allow us to commemorate or honor these moments and people together with our students here at Fuchs Mizrachi School. 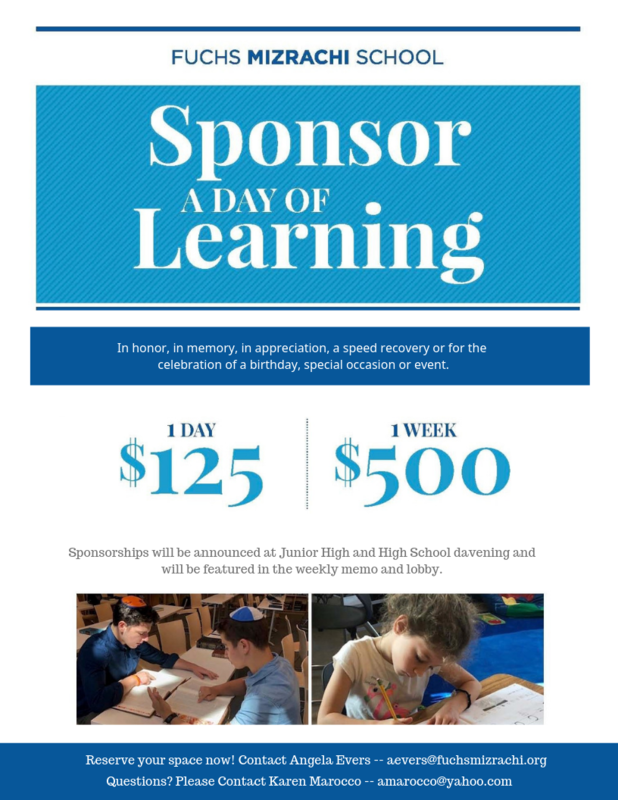 Each day at the end of tefilah in the Junior High and High School we will announce who has sponsored the day or week of learning. It will be also be noted in the weekly memo and will be on display on the monitor in our Atrium, as well. We are excited by the connections and meaning that can bring together our community - of parents, grandparents, alumni, alumni families, community members, and our students.